Ahead of Burnley’s FA Cup fourth round tie with Bristol City at Turf Moor, skipper Tom Heaton has provided young goalkeeper Nick Pope with a glowing reference. The 24-year-old featured in both games against Sunderland in the previous round and is fully expected to get the nod from boss Sean Dyche for the visit of the Robins tomorrow. The former Charlton Athletic stopper, who made his £1m move in the summer, has yet to concede inside 90 minutes for the Clarets, with his only goal shipped coming in extra-time in the EFL Cup defeat against League 2 neighbours Accrington Stanley. Having kept two blanks against the Black Cats in the competition, Heaton said: “He’s been superb. “I’m delighted for him to get out and play. “He’s been excellent in training and chomping at the bit as you might imagine. “I was delighted when Robbo came in and did so well too. The department is in a good position at the minute so I’m delighted for him. The England international feels that his apprentice is benefiting from the support network that is in place at the club with the goalkeeper’s union, headed by coach Billy Mercer, and Dyche all having a positive influence on Pope’s development. “He’s improving, very much so,” said Heaton. “We have a close-knit department with the work we do with Bill day in and day out. “We have a development plan, he tailors everything to each person. “We’re all at different stages of our careers and doing different things and he manages that superbly well so I think Popey has really felt the benefit of that. 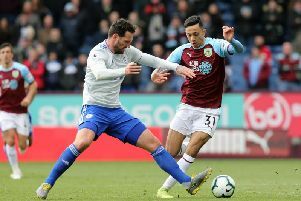 The Clarets have won seven of their last eight games on home soil across the board and Heaton is hopeful that his team-mates can extend that sequence and put their name in the hat for the next round. “It’s another good game, one that everyone is looking forward to,” he said. “We’ve had two good performances so far in the cup. “Hopefully we can continue in that and look forward to the Premier League on Tuesday night (against Leicester City at Turf Moor).